Rarely has the public sent such a clear message that it wanted government to rein in corporations and market forces in favor of consumer and public interest protections. The desire to retain provisions of the Affordable Care Act protecting those with pre-existing conditions was key to Democratic gains. Republicans responded by pretending they agreed with that principle, but few were fooled by this deception. It’s telling that one of the websites used by the firms is called Trumpcarequotes.com. 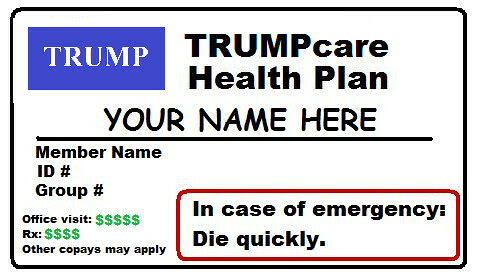 Trumpcare is actually an appropriate term for the crappy coverage—both because Trump has been touting such plans and because the Trump name has been involved in previous scams such as Trump University. The proliferation of junk insurance through the efforts of companies such as Aetna was one of the dismal realities of the U.S. health insurance market that gave rise to the ACA. Republicans have been promoting similar low-cost plans as their solution to the supposed crisis of Obamacare. This is a cynical ploy to use a perverse form of consumerism to restore the old days of limited regulation. Let’s hope the election results have taught them a lesson about the consequences of messing with healthcare.